How can I monitor bandwidth so we don't accidentally exceed our hotspot bandwidth while on vacation? Oh, do I ever know what you mean! We vacation in a spot that supposedly has free WiFi, but too often we can't connect at all or if we can, it's unreliable. We have a Verizon Jetpack that we buy 8GB a month for - that costs $70 and while it's really not enough data, it's all that I want to pay. We also can piggy back on our 2GB mobile plan hotspot if we get desperate, but we obviously need to watch our use closely - no hours of Netflix while on vacation! I can log into the Jetpack and the phone to see data details, but it's a lot better to be able to see it on my computer. And I can. 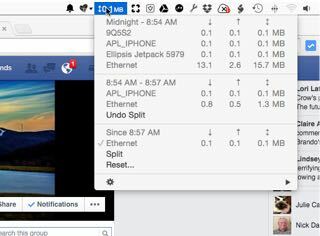 On my Mac (well, my wife's Mac is what we take on vacation), I use Bandwidth+, which is free in the App store. I like that it tracks each connection (the free, the Jetpack, the phone) separately, so we can get a very good idea of what we've used where. I also like that we can "split" the usage by time periods, so if one of us snarfs a gigabyte of precious data, we can know who to blame! On Windows, your builtin Performance Monitor can do this, but you have to specifically select the interface you want to monitor, so that's not all that great. I did a bit of searching trying to find something like Bandwidth+; the only one I found was this Bandwidth Monitor. Of course there are plenty of others, but I don't have the time to go searching and evaluating all of them, sorry. Suffice it to say that you can do this and you'll just need to pick the software you like best.